Web layouts are crucial for every web design. Whether it is a simple design or an advanced one, Photoshop can often come handy in creating such layouts. We have collected some really creative and helpful recent tutorials that display the process behind creating web layouts in Photoshop. 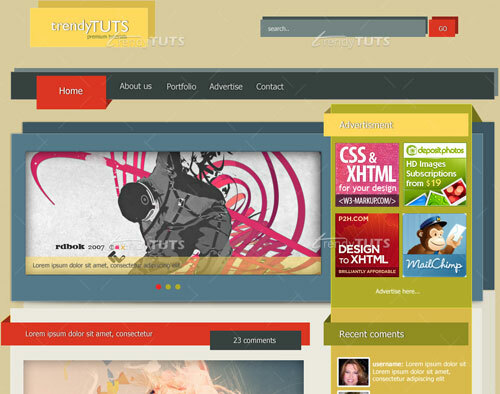 In this tutorial author will create a trendy and colorful wordpress layout in Photoshop. If you’re thinking to redesign your blog, you can follow this tutorial. In this tutorial author will teach you how to create an underwater content box. It will appear as if the content box fell into the water using stock photos and different techniques. In this tutorial, author will show you how to create a minimalist layout for your personal site. Through this tutorial, you will be able to design a professional, clean, elegant and simple minimalist web layout. In this web design tutorial author will create a clean, professional, and modern web layout in Photoshop using the 960 Grid System as our layout guide by using light and bright colors, subtle gradients, thin lines. In this tutorial author will show you how create a clean blue web layout in Photoshop. In this tutorial you will learn how to create a photo gallery website in Photoshop. In this tutorial, author will show you how to construct a portfolio web layout that has a fixed wooden background with Photoshop. In this tutorial author will teach you how to create an outer space website layout that could be used for a portfolio design. In this web design tutorial, author will create a beautiful and colorful portfolio layout using Photoshop. In this tutorial you will learn how to create a unique and original WordPress style layout that looks like a chalkboard. In this web design tutorial, you will learn how to create an elegant and professional web layout that can be used as a web portfolio site. In this tutorial author will show you how to create a textured web layout, starting from the concept on paper to Photoshop design. Author will discuss about site structure and will use the 960 grid to organize our contents. In this tutorial you will learn how to create a light and colorful grungy portfolio layout in Photoshop. In this tutorial, author will show you how to design a modern blog layout in Photoshop. This web design tutorial will show you the process of developing a PSD mockup of a clean and simple blog layout. Author will be creating the design of the front page of the blog. In this tutorial, author will show you, how you can create a web layout for a non conventional energy website. It can be used to create a web layout/template for a green energy website such as solar power, wind power, wave power, geothermal power or tidal power projects. This simple tutorial aims to illustrate some great techniques to adapt into your current web design workflow by creating an Elegant Photography Web Layout in Photoshop. In this tutorial author will teach you how to create a bright and colorful candy store layout with a unique and creative background and header. The focus of this template is on a design agency that offers a range of web-based services and to promote what the business does and what services they provide. In this tutorial, author will create an artistic layout which can be used as a static website (simple HTML page) but in the same time can be integrated with one of the popular CMS platforms such as WordPress, Joomla or Drupal. In this tutorial we will learn how to create a simple yet colorful portfolio gallery in Photoshop. In this tutorial, author will create a website layout in photoshop which can be used for technology website, for a business company, or a hosting website, to showcase your script (software). In this tutorial author is going to show you how to create a clean corporate layout in Photoshop. In this tutorial you will learn how to make a simple and clean layout for your iPhone application. In this tutorial, author will be designing a clean website layout using the 960 Grid System. You’ll see how working with this system can streamline web development workflow, and how to work with a grid system. In this tutorial you will learn how to make a minimal and simple web layout for a business, or portfolio website. In this tutorial author will show you how to create a Real Estate website layout in Photoshop. In this tutorial author will show you creation of a contemporary web page layout that’s perfect for a personal or agency portfolio site with the help of simple Photoshop tools such as layer styles, selection tools, and custom shape tools. In this tutorial you will learn how to make a beautiful and clean portfolio layout in Photoshop. In this tutorial author will teach you how to create a nice theme for an ecommerce website (Magento or Prestashop) using Photoshop. This psd template can be used to create a women clothing shop. In this tutorial author will create a simple, easy to use and colorful web design layout in Photoshop that is primarily aimed at children. The simple navigation, bright colors and limited content is something that would really appeal to the youngsters. In this tutorial you will learn how to create a simple and beautiful theme store layout in Photoshop. Author will show you a quick and easy way to develop a simple dark-themed blog layout with the use of Photoshop by basic Photoshop tools such as the marquee selection tools and layer styles. The outcome will be a professional-level website design mockup that can be converted to a blog theme or HTML web page. In this tutorial you will learn how to create a simple, yet beautiful application page for your iPhone app. In this tutorial author will create a nice weblayout, related to a marketing/seo website which can also be integrated pretty easy with any popular CMS platform, such as WordPress, Joomla, Drupal, etc. In this tutorial you will learn how to create a simplistic portfolio page design with a cloudy header. In this tutorial you will learn how to create a textured and clean WordPress style layout in Photoshop. In this tutorial author will shoe you how to create a nice – brown – website layout using Photoshop. In this tutorial you will learn how to create a clean and minimalistic portfolio layout in Photoshop. In this Photoshop web design tutorial author will design a smashing, clean, and professional website layout in Photoshop which can be used as personal or corporate website design. n this tutorial you will learn how to create a beautiful and clean portfolio in black and white using Photoshop. In this tutorial you will learn how to create a clean and creative WordPress style layout in Photoshop. In this Photoshop web design tutorial, you will learn how to create a slick and minimal-looking website layout by using the 960 Grid System as a template to make it easy to align the design elements on the layout. In this tutorial you will learn how to create a beautiful and clean music streaming website in Photoshop. In this tutorial, author will create a minimalist web site design in Photoshop. Nice list of photoshop tutorials and thanks for including mine as well (Smashing Dzine) I did for SixRevisions. 80% of these layouts looking totally uncluttered an without harmony. This is great! Thanks. But it also depends on the web designer how they can produce their own design. There is nothing about web design. These are just layouts for kids. Web design means that you remember about screen dimensions and trends, able to slice the layout for coder, can make hover/click/active/etc. buttons states etc. all in different and clear Photoshop layers with comments. have you really READ the title & description carefully. Its about making web design “LAYOUTS” in photoshop. any chance my 3 part series be part of the list? psd is included as well. Thank you for the icons; they are really cool! Hey everyone this particular was a good very involved read… This kind of might not really end up being the actual time or site however mabey somebody may help me personally out. I’m seeking a place that will could develop a quality web page for my new business. Oh, of course, if he was really blessed correct at this point why isn’t going to he give us a delivery certificates? Wow incredible blog post! Impressive tutorial dude. It?s ridiculous just how many exceptional tutorials you guys post. Really like your site. Say thanks! Thanks Noupe for sharing these amazing tuts. Very nice collection. Really helpful. Big Thanks. Thanks, nice for beginners like me, useful to add a online store turorial cause different layouts to products catalog.